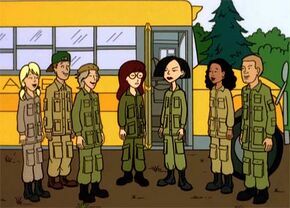 "The Daria Hunter" was the second episode of the second season of Daria (episode number 202). It first aired on MTV on February 23, 1998. "The Daria Hunter" was written by Peggy Nicoll. That evening, Daria and Quinn agree not to tell their parents about the trip. Unfortunately, the Fashion Club put Quinn in charge of developing a hairstyle that will "prevent helmet hair": under extreme pressure from Helen's mild interest in the new look, Quinn holds out for a full five seconds before she blabs the whole thing. Helen is interested, seeing this as a way for Daria to network and gain letters of recommendation for college; Daria resists this claim and Helen tries to get Jake to help her, only for him to remember "forgot to fix that loose floorboard at the other end of the house!" before she can actually say what she needs his help for. A weary Helen decides that she should probably talk to the teachers directly to be an involved parent, and asks if they need parent volunteers for the field trip. "NO! ", cry her daughters, to Helen's clear relief. The next day, the classes travel to Jim's Paintballing Jungle on buses. In the first bus, O'Neill tries to have everybody singing, much to the disgust of everyone else, so DeMartino takes over and starts a lecture on guerilla warfare. Jane tries to convince Daria to ditch the game and go see the “Great White Shark” tourist attraction; Daria protests "it'll be stupid and we're already doing something stupid". Brittany and Kevin try to get Jodie and Mack to play games with them to pass the time ("Monopoly is not a word game"),and Kevin accidentally tells Brittany that he's been dating someone behind her back. In the other bus, the Fashion Club members swear on an issue of Waif not shoot each other on pain of wearing ugly outfits for a whole week, while the 3 J's vow to protect Quinn during the game, to Sandi’s displeasure. Upon arriving, Daria and Quinn have a surprise: Helen and Jake are present as volunteers. It turns out that when O'Neill called about a student review meeting, Helen had asked if they needed volunteers for paintballing in order to seem 'involved'. O'Neill wishes all parents could be this involved! (Helen laughs nervously) As her peers turn to laugh at her, Daria decides the shark is looking good after all. The party arrives and, after a presentation of the field by Jim, students and adults combine in two teams: in the blue team, DeMartino addresses his team members about warfare and pain before stating that the aim of the game is "shoot to kill". Daria points out it's to capture the flag; "whatever", says DeMartino. In the red team, O'Neill gives a sensitive speech (a sighing Helen checks her watch) before being scared off by some air shots fired by Barch. The situation is then taken in hand by Brittany, who surprises everybody when she presents a detailed strategy to win the game. The game starts without warning ("the men are shooting!" cries a panicked Barch) and the members disperse: Jane is quickly shot and cares not a jot; Daria wanders around, wangsting war-movie style, is ambushed by her mother (who loses interest when taking a phone call from Eric) and is then shot by Jane so they can both leave the game. Elsewhere on the field, Quinn, Stacy and Tiffany are discussing boys when Stacy spots a lone figure and asks Quinn if it's Daria. Quinn unleashes an unstoppable barrage! Stacy and Tiffany cheer ("our leader!") while Quinn smirks at the sight of Daria paint-spattered... unfortunately, she'd actually shot Sandi, who had been looking for a bathroom, and Sandi ignores the rules and returns fire. It's a few seconds of combat before everyone has realised what has happened, and the mutual recriminations lead to Sandi asking if Quinn would be President of the Fashion Club. Quinn laughs that off and says she could never replace Sandi... honest... and the two began to glare at each other suspiciously. Meanwhile, DeMartino and Kevin approach the enemy's flag but are surprised by Brittany, who shoots Kevin and then bare-handedly disarms the teacher in an incredible display of martial arts. 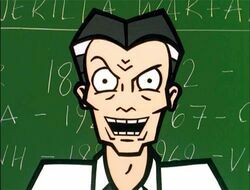 Barch also appears at the scene and, to the horror of the watching students, repeatedly shoots the history teacher while ranting about her ex-husband - she knows DeMartino isn't her ex-husband "but he's not here!". 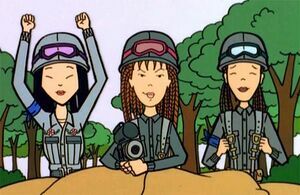 As this happens, Daria and Jane decide to ditch the paintball and go visit the “Great White Shark”. It starts to rain as they walk there so they reach it soaked. Jordana, the woman who runs the museum proceeds to tell them about the shark in a tell tale very similar to “Jaws”. The two students listen for a while, get bored and leave when the rain stops. At the paintball field, the rain has abridged the game. In a tent, Barch raves about her ex-husband to a sympathetic O'Neill. She is so touched by his sensibility that she starts making out with him. In another tent, DeMartino and Jake reminisce about childhood (and get drunk) and discover they both had gone to military school. Helen and Angela Li share another tent and manage to bond, only to antagonize each other when they start discussing Daria; both try to blame each other for Daria's attitude and after a pissed off Helen says Li runs her school like a prison, an enraged Li storms out of the tent while hissing "and by the way, you look FIFTY!". The students relax in a dilapidated building marked as "Hanoi Hilton": Jodie, Mack and others dance, Kevin and Brittany make out in a couch and Quinn is courted by the 3 J's. Sandi, observing this group, seeks and gets reassurance by Tiffany that she is still the cutest of the Fashion Club. However, when she leaves the building to go to a bathroom, her resentment is still showing and she prepares to shoot an unprotected Quinn with a paintball gun, stopping only because Tiffany is blocking her shoot. What Sandi doesn't know is that Tiffany is making a face-turn and reassuring Quinn that she is the cutest of the fashion club. The episode has been used in some fanfiction stories, like Good Art Hunting of the John Lane series by Richard Lobinske, or Apocalypse When? of The James Lane Chronicles by InvisibleDan. The knowledge Brittany displays regarding guerrilla combat tactics has also been used in several fanfiction stories. On DeMartino's blackboard, South Africa is spelt "South Afrka". Background character Jennifer mysteriously appears in the seat behind Quinn on the bus. There's a full group shot at the start of Act 2, and it's pretty obvious that there aren't enough students there to fill two whole buses. Teams Red and Blue are also around ten people per team! Where did all the other kids go? While Daria doesn't get a chance to read in this episode, Ms Barch is reading Susan Faludi's Backlash: The Undeclared War Against American Women. Li is extremely well equipped and armed! It's only a game, Angela! This is where the idea of Quinn deposing Sandi as Club President first comes up in the show. Quinn had previously raised the idea in "The Daria Diaries". Helen pretends she's out of town whenever Mr O'Neill calls about student review meetings because "that man is just so creepy." Kevin says that his dad is "a contractor". Quinn has told Stacy that Jake is her uncle. Jordana's retelling of her struggle with the Great White Shark is a direct retelling of the movie Jaws. The title of this episode refers to the movie The Deer Hunter. Jim's comments on Hanoi Hilton refers to an infamous Vietnamese prison used to hold American POW. 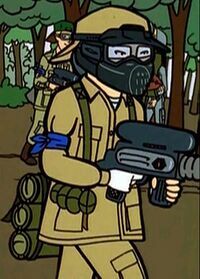 Daria's scene in the forest and her heavy-handed monologue is a homage to Private Chris Taylor's monologue in Platoon. The last scene, with Sandi being left behind while the other students leave, refers to a scene with Elias in the same film, including the same sound effects (music Adagio for Strings, by Barber, and the sound of helicopter blades). A POV shot from DeMartino of everyone standing over him is taken from Full Metal Jacket. Jake crawling through underground tunnels is a nod to Casualties of War. Jake's comments on "...the horror..." is a reference to Apocalypse Now, where Kurtz cries "the horror, the horror!" DeMartino looming out of the darkness is another reference to Kurtz. This page was last edited on 11 July 2013, at 23:38.